The Atlas is a uniting force bringing together the birding and wildlife-watching community, wildlife management agencies, academic institutions, industries, professional biologists and responsible outdoor user groups, in a common stewardship goal: better conservation of our birds and the places they live. The 2006-2010 fieldwork is complete, but the partnership continues to apply the results to research and conservation. Welcome to the Maritimes Breeding Bird Atlas! Books have now started shipping! Order additional copies here (limited quantities available). The Maritimes Breeding Bird Atlas partnership is proud to present one of the largest volunteer-based initiatives in Maritime history, and a major resource for conservation. Leading Maritimes bird experts describe the distribution, abundance, habitat and conservation of 222 species of birds nesting in the region between 2006 and 2010, beautifully illustrated by some of the Maritime’s finest wildlife photographers. Detailed maps show where each species occurs and how common it is, and where data allowed, indicate changes in distribution and abundance from the first Maritimes atlas (published in 1992). Due to overwhelming interest, the Maritimes Breeding Bird Atlas is almost sold out. The project represents a partnership between Bird Studies Canada, Environment Canada’s Canadian Wildlife Service, Natural History Society of Prince Edward Island, Nature New Brunswick, New Brunswick Department of Natural Resources, Nova Scotia Bird Society, Nova Scotia Department of Natural Resources, and Prince Edward Island Department of Agriculture and Forestry, teamed with hundreds of enthusiastic citizen scientists and with many generous donors, from government, foundation, corporate, and private sectors. With over 1,300 volunteers, 48,000 hours of survey effort, and 260,000 records for 222 species of breeding birds, this Maritimes atlas is one of the largest wildlife monitoring projects ever undertaken in the region. The Atlas owes its existence to the skill and dedication of citizen-scientists, organised by an amazing group of 30 volunteer Regional Coordinators, and a team of dedicated partners who analysed data, produced maps and text, and directed the book production. 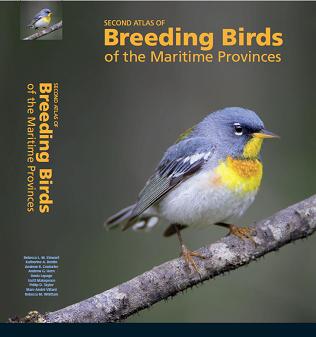 This Atlas is the single most comprehensive, up-to-date information source on the status of Maritimes breeding birds. More than 260,000 records of 222 species are included in the database, including more than 8,700 records of 17 species at risk. Produced as a beautifully-illustrated hard-cover book, the Atlas will also be complemented by a comprehensive website where maps, results and much else will be accessible online. Birders around the world will find the latest maps and information for planning trips and use in the field. Maritimers interested in learning more about their local environment have a new resource to help them interpret this diverse region.